Pinnacle Metal Products is known for crafting beautiful and functional staircases for different businesses in the central Ohio area. Whether it is the Time Warner Building or any other number of college campuses we’ve worked with, we have a long list of clients that love our metal work. However, while we are traditionally contracted to do work for prefabricated steel stairs and walkways, we have many more capabilities than this. And, you can see this when we look at our projects with Columbus State Community College. Columbus State Community College wanted some of the projects we are traditionally given, such as a bridge walkway. However, they also wanted a creative spin on those projects. So, we gave them a safe and secure bridge with metal piping on it that would create unique shadows and patterns on the bridge beneath it. As a sort of covering above it, this walkway is a centerpiece of creativity, encouraging the kind of attitude the College hopes to produce in its students. In addition to the new bridge and walkway, the College also wanted a sculpture for their main campus center. Like the walkway, we crafted this in red. 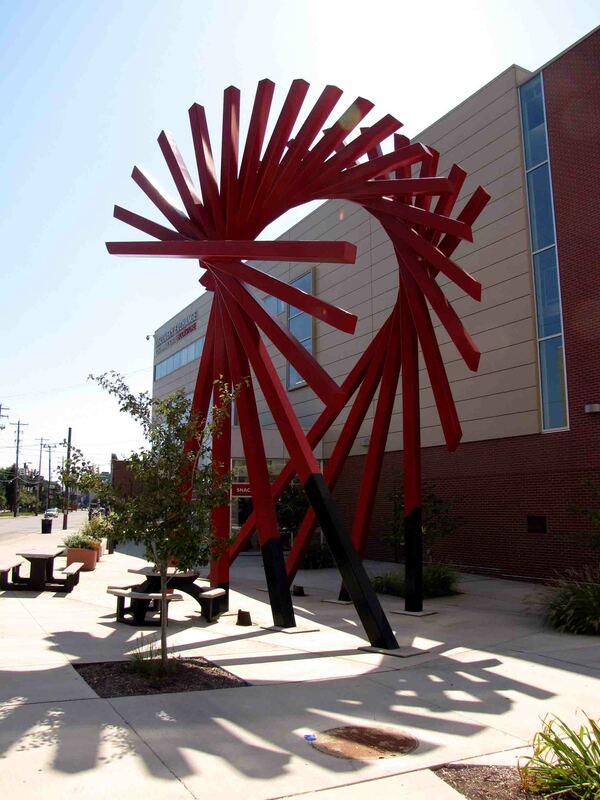 As a unique archway that students use every day as they walk to class, the piece is meant to inspire ideas for students and add another aesthetic appeal to the entire campus. Pinnacle Metal Products doesn’t just work on prefabricated steel stairs. We will rise to any challenge, even creating sculptures or unique walkways. Our passion is to bring your vision and dream for your home to life. Give us a call at 1-614-298-0300 to begin thinking about what your next project could be.